0.0.1 Living Room and Dining Room – Decorating your living environment involves lifestyle choices that are reflected in personal taste. Living Room and Dining Room – Decorating your living environment involves lifestyle choices that are reflected in personal taste. Combining Living Room and Dining Room needn’t be decorated alike just because they are next to each other. You can use a totally different color scheme in each room as long as your color choice creates a unity to the spaces. The wall colors have a big impact on the look of the room, so choose your colors with care, but don’t be afraid to make your own statement. Using a color wheel from the paint manufacturer of your choice, create a color scheme of three different colors for your living room and dining room. Use the size of your rooms, the amount of light streaming in through windows and flooring as your guides for selecting your colors. 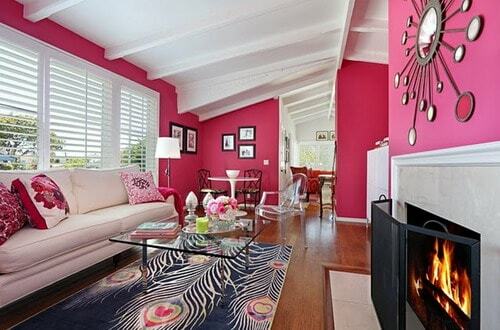 Don’t be afraid of color, as it enhances the styling of your rooms. Modern décor in black, white and red, or Craftsman designs of yellow, brown and turquoise are bold choices that transform nicely in combining rooms. Use each color in a variety of tones, from light to dark, to add interest and depth. Paint the wall that runs from your living room into the dining room the same color. Use the lighter hue from your color palette to open up both spaces while uniting the rooms. Paint baseboards; crown molding, windows and sills one shade lighter or darker in a semi-gloss paint for a slight contrast. Paint the feature wall of both rooms a dark tone of your most bold color to add drama to your décor. This creates unity between the rooms while giving each a prominent wall for hanging artwork or displays. Or create a paint version of two-toned wallpaper by painting stripes of semi-gloss and eggshell. This formalizes a living room and adds to a dining room’s elegance. Hang a chair railing in the dining room, painted in semi-gloss of the wall color above it, and apply a decorative wall paper below the rail or a darker shade of the color above. This personalizes the dining room and gives it a look of its own. Or use semi-gloss on one wall and eggshell on another, in the same color, for visual effect. Don’t ignore the ceilings of the two rooms. Step outside the comfort zone of a white ceiling and use a light shade of your lightest color choice. Not only does the ceiling color lead eye upward, it creates a finished look to your rooms. 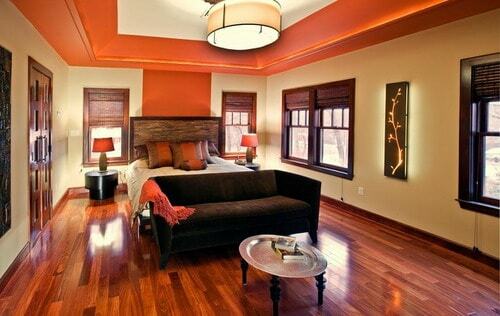 If your ceiling are high they are excellent candidates for a deep, intense color. Paint the feature wall crimson and continue the color onto the ceiling.